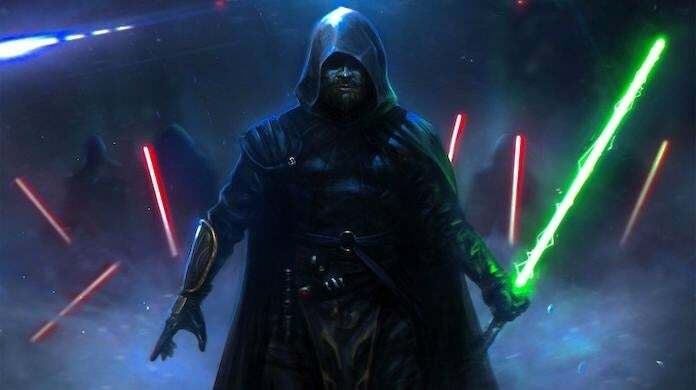 According to a new leak, Star Wars Jedi: Fallen Order is canon and will have combat that fans of FromSoftware games -- like Bloodborne, Dark Souls, and Sekiro: Shadows Die Twice -- will appreciate. The new single-player Star Wars game from Respawn Entertainment -- makers of Titanfall and Apex Legends -- and Electronic Arts is poised to be revealed tomorrow, but before that happens, details on the game have begun to leak out. Well, potential details. According to a new leak on Reddit, the game will be 100 percent canon and aim to expand Star Wars lore, but will also bring players to some familiar locations where presumably some familiar faces will be residing. This is significant because it gives the game's story some weight. It's not going to matter as much as a movie, but it does matter. Story details are light, but the leak claims players will step into the shoes of a Jedi, who, accompanied by a side-kick droid, will explore multiple planets as the game's narrative unfolds. And given that the game's official poster was revealed yesterday starring a side-kick droid, this part at least seems accurate, which gives some validity to the rest of the leak. Beyond confirmation that the game's story will be canon, the leaker also claims combat will be Dark Souls-esq, with an emphasis on parrying like there is in Sekiro: Shadows Die Twice. According to the leaker, there also may be wallruning and parkour, both of which will be parts of a combat and movement system that makes players feel like a Jedi. Of course, all of this should be taken with a grain of salt, but since the leak emerged, multiple of its claims have been confirmed. So, either they got lucky, or they truly are scoop city. Thankfully, we don't have too wait much longer to find out, because the game is being revealed tomorrow, and hopefully it will be accompanied by a proper information dump. In this latest episode, we talk about that Joker trailer, WWE Wrestlemania 35 and more! Make sure to subscribe now and never miss an episode!